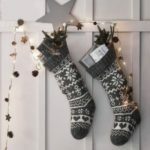 MChristmas cheer can come in small packages! 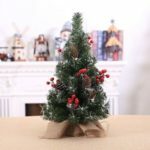 This mini Christmas tree comes pre-strung with lovely artificial pine cones, red berries and snow to create the perfect atmosphere for the holidays. 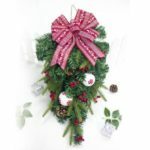 Especially perfect for small spaces or to add a bit of holiday cheer to a room, it can easily fit on a desk or nightstand. 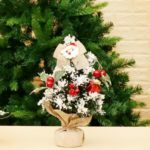 Just add some finishing touches like small ornaments and some ribbon, and you&apos;ll have a delightful Christmas tree to enjoy through the holiday season! 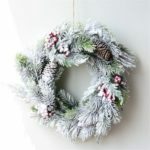 Includes variable ornaments: artificial pine cones, red berries and snow spread throughout the branches. Sturdy base helps support and balance the tree, preventing it from tipping over. Perfect as a dinner table centerpiece or decorative addition to a nightstand, countertop, or an office desk due to its compact design.